The year 2007 marks the 300th anniversary of the birth of one of the Enlightenment’s most important mathematicians and scientists, Leonhard Euler. This volume is a collection of 24 essays by some of the world’s best Eulerian scholars from seven different countries about Euler, his life and his work. 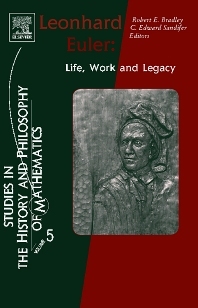 Some of the essays are historical, including much previously unknown information about Euler’s life, his activities in the St. Petersburg Academy, the influence of the Russian Princess Dashkova, and Euler’s philosophy. Others describe his influence on the subsequent growth of European mathematics and physics in the 19th century. Still others give technical details of Euler’s innovations in probability, number theory, geometry, analysis, astronomy, mechanics and other fields of mathematics and science.